Have you asked yourself what this so-called 'Headless CMS' is all about? If so, you're not alone. And as it represents the direction technology is leading us, digital marketers and technologists must really start thinking about how the Headless CMS concept applies to their individual unique needs. How will they use it to effectively communicate with their respective organizations' customers, partners, and employees? Traditional CMS systems were built for website content delivery. But over the past decade, technology has evolved and users are consuming content through more devices than ever. Last year, mobile internet usage overtook desktop usage for the first time, and the new era of smart devices, virtual reality, bots, digital assistants and the "Internet of Things" has only made content delivery all the more complex. Suddenly, your content can be displayed on any device using any format. This seismic shift requires a completely new approach to how content is managed and published. Learn more - Download "Headless CMS: Facts and Benefits"
The reality is that we need to embrace this brave new multi-channel world in which the consumption of content is uncoupled from being delivered and consumed primarily via the desktop environment and instead distributed in a countless number of new ways. Content truly is king, but how it's been traditionally compiled, managed and delivered remains an obstacle as technology continually evolves around us. To address this challenge, the concept of the Headless CMS was devised, to represent the framework by which we could free ourselves from being dependent on the traditional CMS solution. Instead it allows for delivery of content, via any channel, using what's called a 'Content API', and it does so in an agile fashion, so as to help accommodate the evolution of how content is consumed both now and in the future. For those of us that learn visually, this short video provides a great way to quickly wrap your head around the headless concept. Using a headless CMS will allow you to spend more time focusing on content creation rather than content management. Since updates are pushed across all digital properties, creators no longer must worry about how content will be displayed, speeding up the production process. Also, unlike traditional CMS architecture, a headless CMS allows integration with any codebase or programming language, providing much greater flexibility for developers. Security, scalability and performance issues all are virtually non-existent. Headless CMS allows you to focus solely on your website, with no need for installing the latest security updates or going offline to make updates. Your CMS vendor maintains everything you need in the cloud to keep your site online and secure. I always recommend that customers try to be forward thinking, and stay ahead of their competitors in the digital space. The headless CMS - a valuable model built for both today's digital world and the technology of the foreseeable future - may be worth considering to keep your entire content ecosystem ahead of the curve. 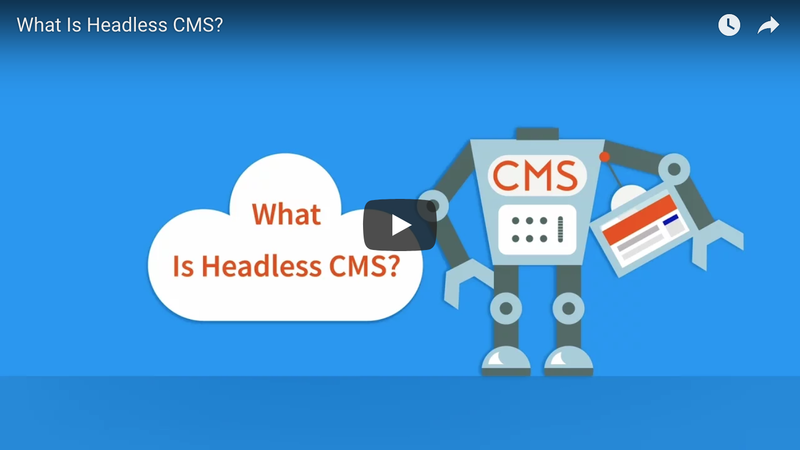 Want to learn more about whether a headless CMS could work for you? Learn more by reading our fact sheet "Headless CMS: Facts and Benefits." compiled by our own BlueModus technology experts.